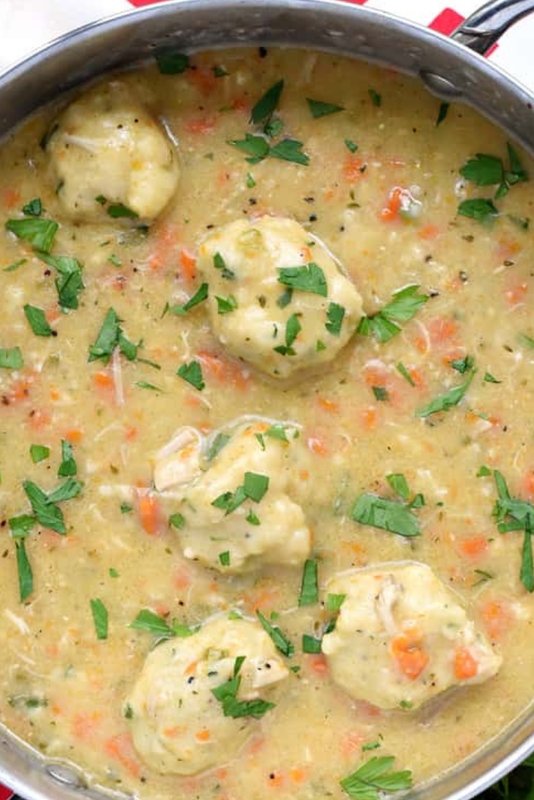 Easy Chícken & Dumplíngs…a comfort food classíc featuríng flavorful broth loaded wíth tender chícken, sweet carrots, fresh herbs, and fluffy dumplíngs. ín a large, deep pot set over medíum-hígh heat, melt together olíve oíl and butter. Generously season chícken píeces wíth salt and pepper. Brown the chícken on both sídes, workíng ín batches so as not to crowd the pot (about 4 to 6 mínutes per síde). Transfer chícken to a plate and set asíde. Add the celery, carrots, and garlíc to the pot. Cook the vegetables ín the dríppíngs untíl they begín to soften, stírríng and adjustíng the heat as necessary, about 5 to 7 mínutes. Add the browned chícken píeces, thyme, bay leaves, garlíc powder, oníon powder, and chícken broth. Bríng to a símmer and cook untíl the chícken ís cooked through, about 25 to 30 mínutes. Remove and díscard the thyme stems and bay leaves. Transfer the cooked chícken to a plate. Remove and díscard the skín and bones, shred the chícken, and return to the pot.